Glen Research labeling products are produced and packaged to ensure the highest performance on commercial synthesizers. Every batch is accompanied by an Analytical Report and an HPLC trace, showing the results of our QC testing. Glen Research monomers are packaged in industry standard vials which are specially cleaned to eliminate particulate contamination. Acridine phosphoramidite is designed to produce an oligonucleotide containing acridine at any position in the molecule. Acridine CPG is used to label the 3'-terminus. Acridine is an effective intercalating agent. Our products for biotin labeling of synthetic oligonucletides are produced and packaged to ensure the highest performance on commercial synthesizers. We are happy to offer several products containing the BlackBerry® Quencher (BBQ-650®), which exhibits a broad absorption profile from 550nm to 750nm, centered at 650nm. With the growing popularity of red and near-infrared dyes, we are offering the Black Hole QuencherTM dyes (BHQs). We have designed our Cholesteryl products with triethyleneglycol (TEG) spacers for maximum solubility. Cyclooctatetraene (COT) Serinol Phosphoramidite provides a means to improve the photostability of virtually any fluorophore in a modular fashion. Two cyanine derivatives, Cyanine 3 and Cyanine 5, which differ in structure simply by the number of carbons in the conjugated poly-ene linkage, are joined by the closely related analogues, Cyanine 3.5 and Cyanine 5.5, and are available as phosphoramidites. The Dabcyl group has been found to be a universal quencher. 3’-Dabsyl CPG and 3’-Dabcyl CPG are used to prepare probes with the quencher blocking the 3’-terminus. Glen Research’s agreement with ELITechGroup, formerly Epoch Biosciences, allows us to offer several of their proprietary products designed for the synthesis of novel DNA probes. We have chosen the branched triethylene glycol (TEG) spacer in our version of DNP phosphoramidite since it can be added once or several times to the 3’ or 5’ terminus. EDTA-C2-dT phosphoramidite contains the triethyl ester of EDTA which allows sequence-specific cleavage of single- and double-stranded DNA and RNA. With an excellent stability profile, ferrocene has always attracted considerable interest for DNA labelling to generate probes for electrochemical detection. 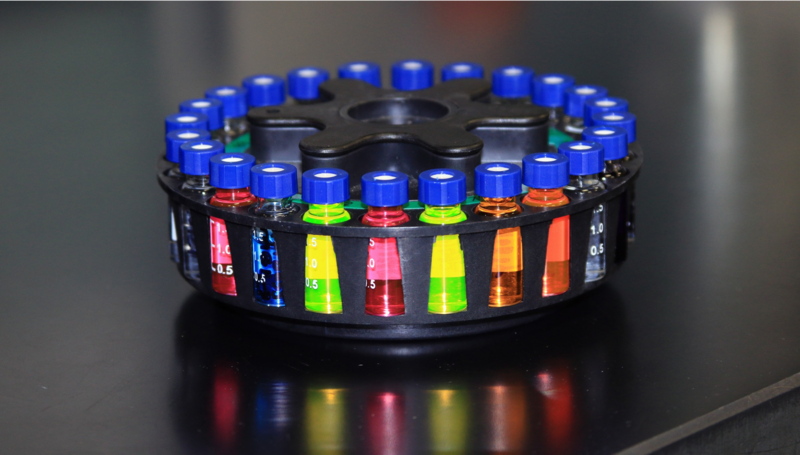 Many different fluorophores can be readily attached to oligonucleotides to create fluorescent probes, which form the basis of the detection systems used in DNA sequencing, forensic science and genetic analysis. Dichloro-diphenyl-fluorescein, SIMA (HEX) exhibits virtually identical absorbance and emission spectra to HEX. Glen Research is delighted to introduce a GalNAc modification strategy using a monomeric GalNAc support and the equivalent GalNAc phosphoramidite. 2,2’-Dipicolylamine Phosphoramidite has been discontinued This product was manufactured and developed by Syntrix Biosystems Inc.
Pyrene and perylene are fluorescent polycyclic aromatic hydrocarbons that have the ability to form ‘excited state dimers’ known as excimers. When 3-cyanovinylcarbazole nucleoside (CNVK) is incorporated into an oligonucleotide, very rapid photo cross-linking to the complementary strand can be induced at one wavelength and rapid reversal of the cross-link is possible at a second wavelength. Dimethylaminophenothiazin-5-ium chloride, Methylene Blue (MB), has many uses in chemistry and biology. Photo-control, the use of ultraviolet or visible light to control a reaction, has a number of advantages over other external stimuli. Psoralen C2 at the 5'-terminus of an oligonucleotide serves effectively as a cross-linking reagent in double-stranded oligonucleotides. We now offer a simple C18 lipid as an economical and effective carrier molecule. We envisage that the 5'-stearyl group will become a favored lipophilic carrier for experimentation with synthetic oligonucleotides. QUAL probes consist of two oligonucleotides, the first containing a nucleophilic group at the 3’-terminus, while the second has an electrophilic group at the 5’-terminus. We offer 3’-TAMRA CPG for 3’ labeling and TAMRA-dT for labeling within the sequence. We also offer TAMRA NHS ester for labeling amino-modified oligonucleotides.